If you think plants are just there to make your office or home prettier, think again. Plant-based skin care products now exist that can deliver great results with their all-natural active ingredients.We found a local gem that gives your skin the natural love it deserves. Heart Skin has several products in store that are good for your body and deliver powerful benefits at very affordable prices. Their Honey Bee Wash (Php150) is a facial wash made specifically to prevent skin dryness. The Honey Bee Wash is a product that best stalls the aging of skin. It also has antibacterial properties that treat and prevent acne and skin allergies, making your skin softer and smoother with every wash.
Heart Skin has two types of toners: Pink Toner and Green Toner. The Pink Toner (Php150) doesn’t have the drawback of whitening your skin and drying it out at the same time as most toners do. Its natural botanical extracts and antibacterial properties aid in maintaining the health of your skin, giving you a pinkish, youthful glow. If you want that ‘porcelain’ look, go for this. It’s best used after washing with the Honey Bee Wash and before applying creams day and night. It gives a glowy finish, especially when paired with the Night and Day Cream. The Green Toner (Php150) is their bestseller, though. It’s packed with natural lightening agents and pore minimizers that aid in the skin purifying process. It’s great in helping your skin go through its natural cleansing method for fairer, more refined skin. It specifically has a cooling effect that leaves you feeling fresh. Now, say hello to Heart Skin creams. The Night Cream (Php200) smoothess and moisturizes your skin, giving you a clear, radiant look. It can easily be absorbed and helps reduce wrinkles and fine lines, leaving your skin bright, even, and healthy. Its claim to fame is that I-woke-up-like-this look a day after application. It gives you brighter skin without overdoing it. Best used after washing your face with Honey Bee Wash and applying Pink or Green Toner in the evening. The Day Cream (Php180), on the other hand, acts as a great moisturizer that enhances your skin’s healthy glow. Specially made ingredients will aid you in concealing wrinkles and fine lines. It can be used as a primer, too. Depending on the look you’re after, the cream itself can have a glowy effect. Or, if you want a more matte finish, you can cover it up with powder. The Facial Bleaching Cream (Php200) is the perfect way to cover up your skin’s imperfections without completely blocking your pores. It helps prevent skin darkening and conceals skin blemishes. Let this cream do its magic while you sleep. It’s also recommended for lightening acne dark spots. Oh, and we know a lot of you will love Heart Skin’s Underarm products. The Underarm Bleaching Deodorant (Php200) was created with the intent of managing melanin production, which causes the darkening of your underarms. It has also been formulated to keep your underarms dry. Thanks to its natural whitening extracts, it gives you that much needed 24-hour protection when going out. It’s a fave deo for many because it doesn’t have that sticky feeling and it’s like you’re not wearing any deo at all! It doesn’t stain your clothes, either. Just apply enough amount using cotton during the day before going out. You can see it removes dead skin on your underarms, making it fairer with every use. DO NOT use it as a spray deodorant. The Underarm Whitening Cream (Php250) prevents and transforms dark underarms into a healthier whiter shade. Coupled with its antiperspirant properties, it keeps your underarms dry giving you that fresh, carefree feeling throughout the day. The cooling effect leaves you feeling immediately refreshed after application. Put enough amount on in the evening, and you’ll notice how soft and smooth your underarms feel when you wake up. 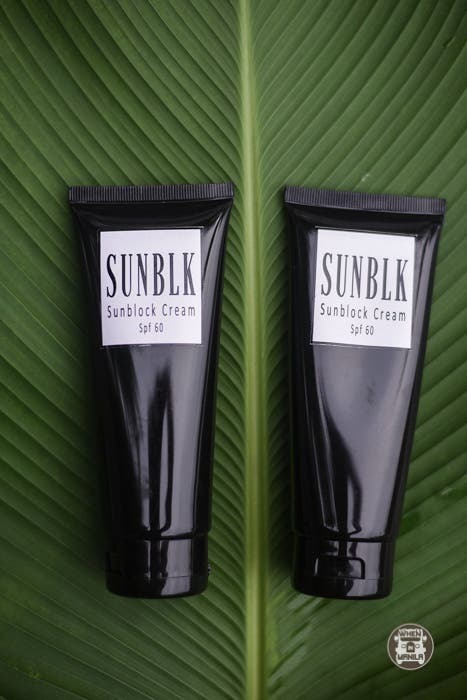 We love the non sticky feeling that Sunblk (Php260) provides along with its SPF60 screen. It protects and takes cares of skin with its moisturizing properties, too. It can also be used before makeup as a moisturizer, and can also be used on the body. Happy users say that Heart Skin products aren’t sticky on the skin, pimple marks fade fast, and they generally leave them feeling fresh. So should you try Heart Skin products? I’d say give it a go. Aside from supporting locally made products, the prices are crazy affordable for the natural benefits you’ll get. Fandom Geeks Unite! Splatt MNL Makes All Your Fandom Dreams Come True!